9 Best hikes in Scotland that offer breathtaking views! What are the best hikes in Scotland? That’s a tough question, because the scenic landscape in Scotland provides you with amazing Highland treks, coastal trails and loch-side hikes. I asked various travel bloggers what they consider the best hikes in Scotland, which resulted in this listicle with 9 amazing hikes; from landscape of cliffs and rocky pinnacles to white sand beaches and castle ruins, each and every hike in this article rewards you with breathtaking views of Scotland! Scotland has so much to offer (did you know it was named “The most beautiful country in the World” by the readers of the Rough Guides?) and is definitely worth a visit. If you’re considering a visit to Scotland and in particular a road trip, be sure to check out this Travel Itinerary for a 9 Day Road Trip in Scotland. Under each recommendation for a hike in Scotland you can find how difficult the hike is. Please be aware that this is very objective. How difficult it eventually is for you personally depends on your health, condition and experience. This spectacular hike takes you into the heart of the Quiraing and its dramatic scenery, with its landscape of cliffs and rocky pinnacles. Located on the Trotternish Peninsula, on the Isle of Skye, the Quiraing is an area formed by a series of giant landslides. 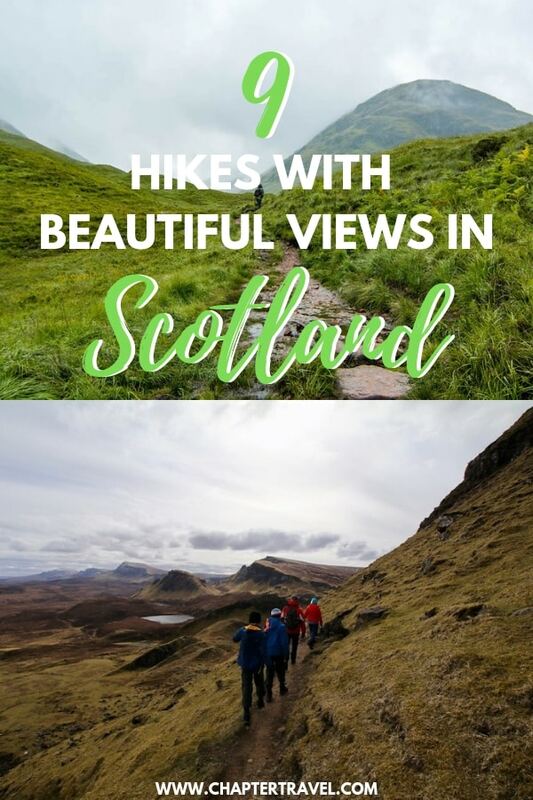 There is a 7 kilometre circular hike that takes you up and over the Quiraing, giving you amazing views across the Isle of Skye and getting you up close to the rocky pinnacles. The entire circuit takes approximately two hours. The path is rocky, and at times narrow, with some steep drop offs. Initially the path traverses the escarpment before getting up close to the rocky formations. The Needle is one such pinnacle, with the Table beyond, a flat grassy area, out of sight, in the middle of the Quiraing, surrounded by rocky towers. Legend says sheep and cattle were hidden here when raiders were spotted! The ascent to the Table is tricky, on some very steep, eroded ground. The circular hike returns across the cliff tops back to the start point. The entire circuit should only be hiked in good conditions, but the hike to the Needle is possible throughout the year. 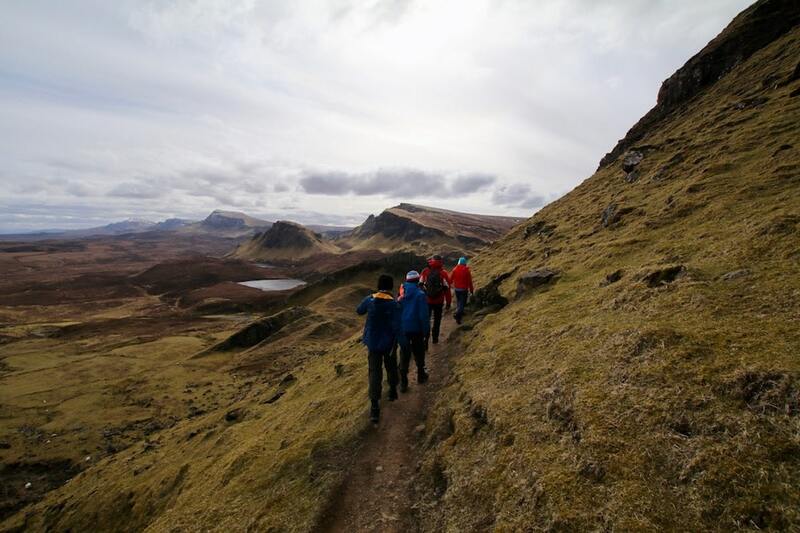 How hard is the Quiraing on the Isle of Skye hike? It depends on which route you decide to take, as there are multiple options in the Quiraing area. Most of them are moderate, as they don’t take long, but with some steep parts. Written by Nicky Williams of Go Live Young. The beautiful Kingdom of Fife sits on a peninsula in the east coast of Scotland, around 30 minutes from Edinburgh. The Fife Coastal Path covers 117 miles of coastline between Kincardine Bridge in the south and the Tay Bridge in the north, passing through cute colourful fishing villages, charming towns and St Andrews, the world famous home of golf. The hike is best spread out over a week and there is some great little Bed & Breakfast’s along the way. In particular I’d recommend spending some time in the East Neuk villages of Anstruther, Pittenweem or Crail, where you’ll find adorable pastel coloured houses and picturesque fishing boats in the harbours. A night in St Andrews enjoying the top class restaurants is also a must. 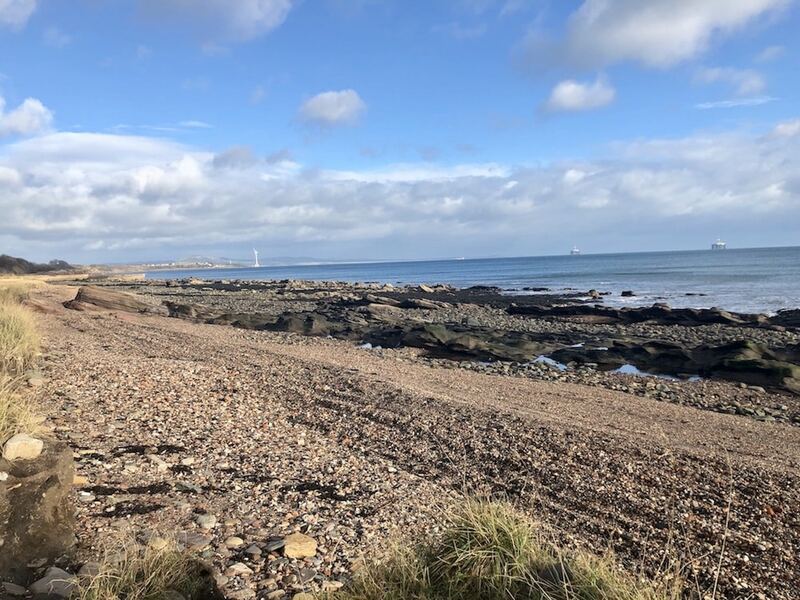 The white sand beaches, sea cliffs, castle ruins and views across the Firth of Forth along this coastline are absolutely stunning and it’s the perfect hike for anyone wanting beautiful scenery with not too much effort. How hard is the Fife Coastal Path hike? The hike is moderate. Some sections are easy but some can be slippery and steep. Written by Nicola Holland of FunkyEllas Travel. The Fairy Pools are one of the most popular attractions on the Isle of Skye. While many tourists visit these beautiful waterfalls by car, there is another (more spectacular) way of getting to the Fairy Pools. If you want to immerse yourself in the beautiful landscape of the island, head to Sligachan and make your way to the Fairy Pools from there. Sligachan is one of the remotest places on the Isle of Skye, but there is a hotel and a campsite where you can spend the night. 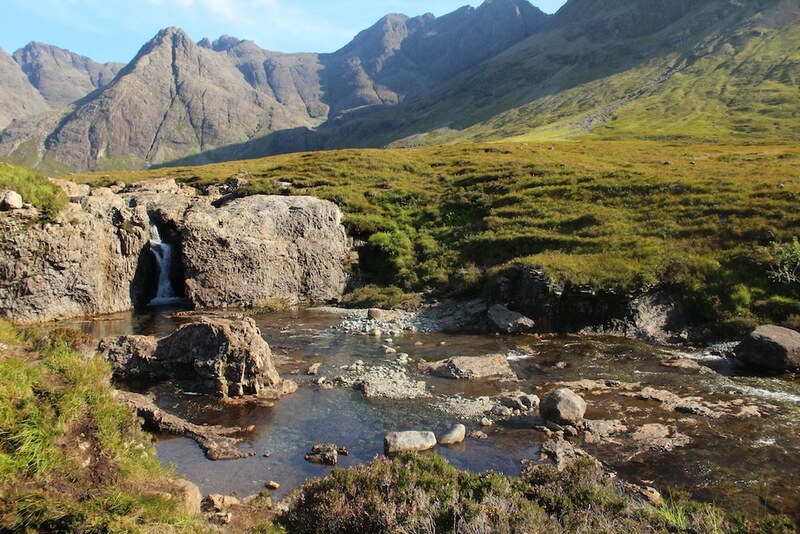 The path to the Fairy Pools starts just off the main road and runs along the stunning Cuillin mountains. There is a nice stream along the way, and you might also encounter some sheep grazing on the hills. The walk from Sligachan to the Fairy Pools takes about 2.5 hours – or up to 4 hours if you take frequent breaks and loads of photos. Known for their clear turquoise waters and multiple waterfalls, the Fairy Pools are the highlight of the walk. On a warm day you can find people swimming in the natural pools. How hard is the Sligachan to the Fairy Pools hike? This is a moderate walk. There is some uphill walking involved, and the path along the stream can be a bit slippery. Written by Daniela Frendo of Grumpy Camel. 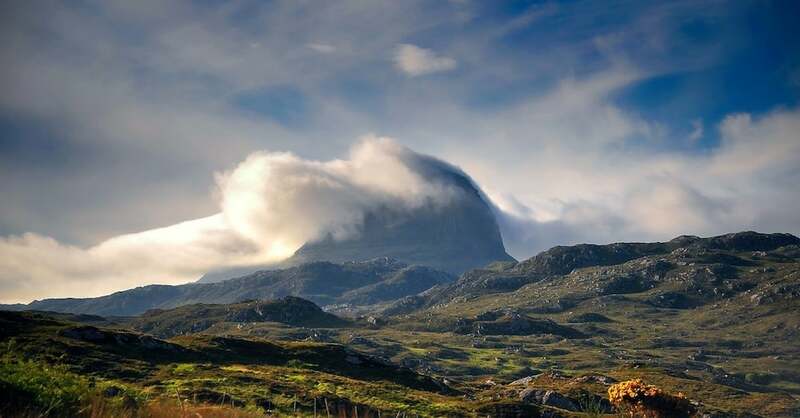 Suilven peak is the most famous peak of Assynt’s mountains. This mountain range is located in North West of Scotland and is a truly beautiful region. The dramatic, out of this world rock formations are considered by many hikers as the best hillwalking option in the whole of Britain. Suilven mount is a 2-kilometre long rocky ridge. It reaches just 731 metres, but it raises straight up from the sea level, which makes it prominent and actually look higher. To get to Suilven we can either walk from Lochinver, or go by car to parking lot, just before we get to Glencansip Lodge on Cansip Road. Trail head is in Lochinver village. At the beginning there is a wide trail which winds its way the through lochs, bogs and moorland of the Inverpolly Nature Reserve. We keep following a small gully which we climb directly up the face of the hill – the trail zigzags sharply back and forth. As we reach the bealach we get to admire amazing landscape of Suilven’s surroundings. When we get to the summit the view opens up even further. If the weather is favourable we can see all the way to Skye and the Western Isles. The climb and walk back is 20-kilometre long and will take around 8 hours from the carpark before Glencansip Lodge. It takes about 9-10 hours if you have to hike all the way from Lochinver. How hard is the Suilven hike? Hike to Suilven is not technically hard, but fairly long. The hill is about 10 kilometres from the nearest road and involves a near vertical hike to the summit and a very long walk back, so it’s necessary to take lots of food, water and be prepared for changing weather conditions. Written by Joanna of Over Here. The West Highland Way is a 96-mile multi-day hike from just outside Glasgow up to Fort William in the Highlands of Scotland. Along the Way, you will enjoy stunning scenery along the banks of Loch Lomond, walk across the vast and sometimes bleak Rannoch Moor, and marvel at the dramatic mountains in Glen Coe. Make sure that you have a good pair of broken in boots, plenty vaseline and Compeed plasters to minimise the blisters, and a whole heap of insect repellent. The Scottish Midge can be relentless. If you are not used to sustained hiking, I would recommend using the baggage transfer service so that you only need to carry a day sack and, if you are not camping, make sure you book your accommodation along the route well in advance. If you have the opportunity, make sure you book a night in the Rowardennan Youth Hostel. This beautiful old building sits right on the shore of Loch Lomond and soaking your tired feet in the water over the edge of their pier is a great way to end a long day! 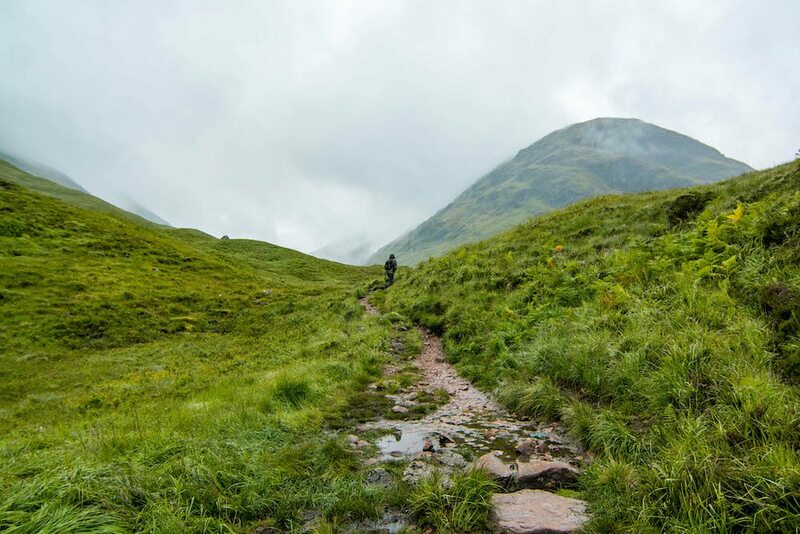 How hard is the West Highland Way hike? This hike is usually walked in 4 – 8 days, depending on your fitness levels. It is a moderate level challenge. Written by Gemma Johnstone of A Girl and her Dog on the Road. 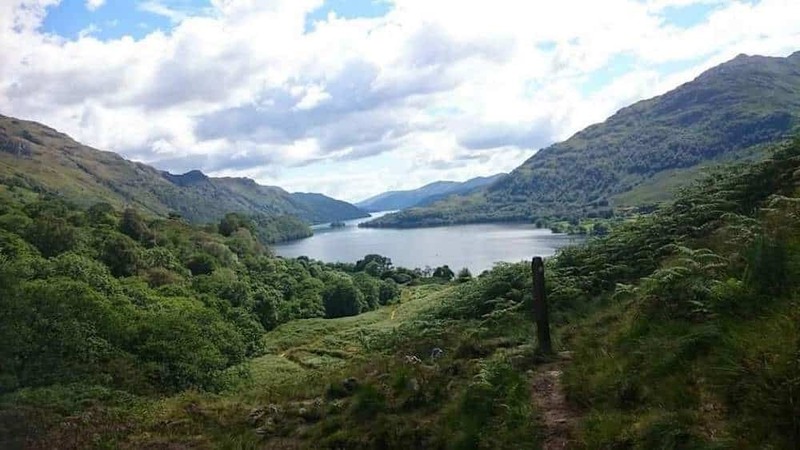 There are several amazing hikes in Loch Lomond, but not many of them offer such fantastic views with little effort as Duncryne Hill, also known as the Dumpling by locals. The views from the hilltop are very impressive, despite the fact that it doesn’t require too much effort to get to. There is free parking available in Gartocharn. It takes about 30 minutes to get to the very top of the hill. The path is well signposted and easy to follow. Luckily this hike is not very well known, so you can often have the whole place to yourself and enjoy the peace and quiet. 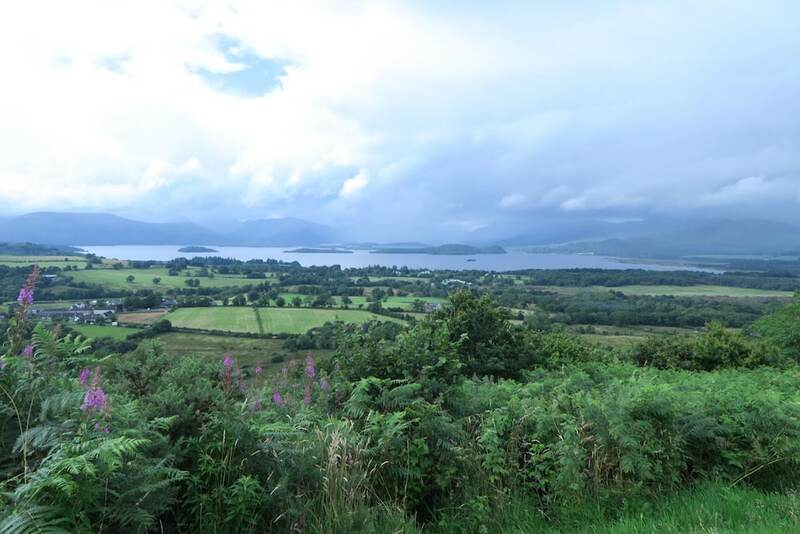 You will see Loch Lomond with its many islands, The Cobbler and Ben Lomond. You can make it a great excursion from Balloch, which is a popular weekend destination at Loch Lomond. How hard is the Duncryne Hill hike? This is a great walk for families with young children as the terrain is easy and the hike is only about 2 km return. Written by Eniko Krix of Travel Hacker Girl. My favourite hike in Scotland was Ben Lomond. Located next to Loch Lomond in the Scottish Highlands, Ben Lomond stands at 974 metres. There are 2 main paths up, one the tourist route starting in Rowardennan car park and the other starting just past the national trust lodge. I only met a few people taking the alternative route but it is well worn and easy to follow. As I was staying in the lodge I decided to do the alternative route and return via the tourist path. The hike starts in the trees but very quickly you are out of the tree line. I was very lucky it was a beautiful day, though still quite windy and making it a little cool especially at the top. It’s best to take a few layers and waterproofs as the weather can change very quickly there. 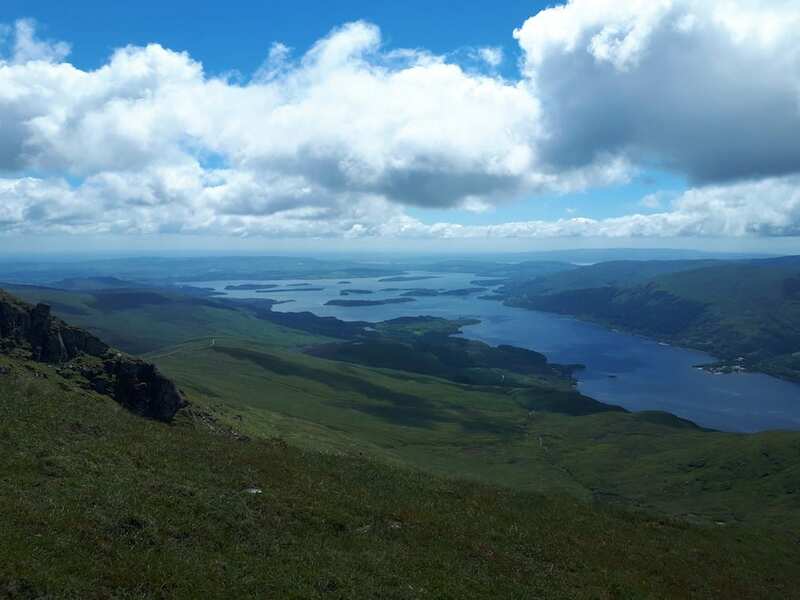 The views hiking up are amazing, I could not stop looking at the amazing views of Loch Lomond and the surrounding mountains. I took hundreds of photos!! It generally takes between 6-8 hours to do the hike and it is amazing to sit at the top, get a few photos and chat to others who made it to the top to see the amazing views too. How hard is the Ben Lomond hike? I would say the hike is a moderate/hard hike depending on whether you are used to hiking mountains. The hike takes long and it’s quite a climb. Written by Clare from Travels In Peru. Goatfell is a popular hike on the Isle of Arran. It is the highest peak on the island and the views from the top are breathtaking. It is within easy reach from Glasgow – an hour to Ardrossan and an hour by ferry to the island – and it takes about 3 hours from the car park to the top. Rail+Sail tickets allow easy accessibility by public transport. All that make it a fantastic day trip from the city and on a sunny day, the trail is busy with outdoor-loving day hikers. 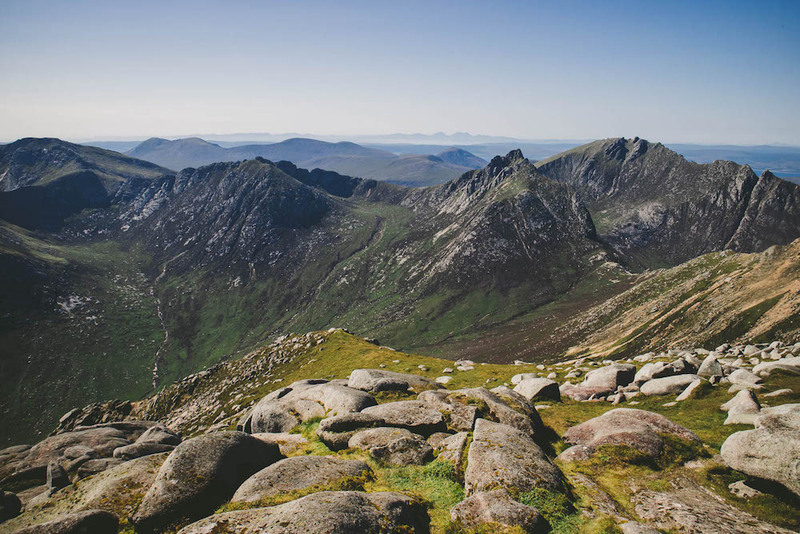 From the summit on Goatfell at 874 metres, you can enjoy views over the surrounding mountain range and the islands. You can see the Kintyre peninsula to the west and the Paps of Jura in the far distance. The path is signposted from the starting point behind the Isle of Arran brewery and easy to follow all the way to the top – no navigation skills are necessary, but the final section before the summit requires some strenuous scrambling. On a good day, it is still a very family-friendly day hike though. Wear proper hiking boots, bring a backpack with spare clothes and lunch pack and plenty of water – especially on a sunny day. There is plenty of space for a lunch break at the summit and don’t forget to take a photo of you standing at the rocky peak, overlooking the Highlands around you! How hard is the Goatfell on the Isle of Arran hike? This hike is considered moderate. It’s quite a climb! Written by Kathi of Watch me See. Glencoe is also a great place for various beautiful hikes in Scotland. This beautiful location offers a lot of scenic views. One of the hikes we did was a hike at Lairig Gartain. We woke up early and did a loop that took us 4.5 hours. This walk actually combines two passes between Glencoe and Glen Etive, namely the Lairig Eilde and the Lairig Gartain. If you prefer a shorter hike, you can also decide to hike Coire Gabhail, also known as the hidden valley. Because of some parts of steep climbs this trail can be challenging at times. How hard is the Lairig Gartain hike at Glencoe? The hike is moderate. The walk is mostly flat, but takes quite long. 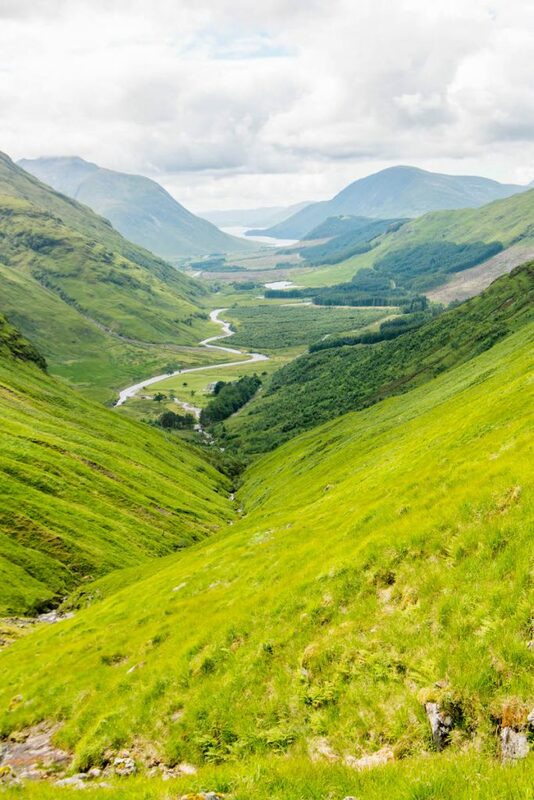 Have you ever done a hike in Scotland? Let us know in the comments!